The Bold N Bright tire dressing is the perfect dressing for your tires when you want a bold finish and a dressing that nourishes your tires. If you prefer heavy gloss than apply the Bold N Bright heavy and let it air dry. For a more matte finish you can apply it lighter and buff dry. Either way you get a great dark tire that looks new again. The Bold N Bright is readily absorbed by the rubber so you don't have to worry about harmful tire sling on the paint. The UV inhibitors are good for your tires because they help prevent dry rotting and browning of tires, unlike dressings that are primarily silicone based. Give your tires the best with the Poorboy's World Bold N Bright! 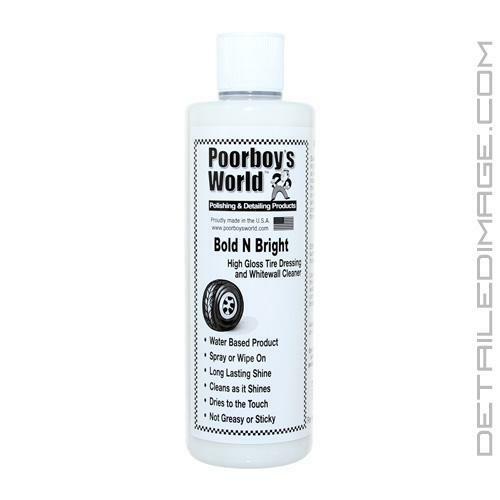 Bold N Bright is a unique concentrate for cleaning the dirtiest whitewall tires, while leaving an awesome Bold N Bright finish on tires & rubber. This water-based formula will dry to the touch in just a few minutes when wiped on tires or rubber. It also helps to preserve and prevent dry rotting. Use in the engine compartment on all rubber and plastic parts for a great look. DIRECTIONS: Either spray directly on tires, wheelwells or surface, and leave, or wipe on tires and follow the next steps: Using a clean cloth or foam sponge, wipe the surface of the tire. If using on whitewalls, repeat process. Using another clean cloth just on whitewalls or RWL. Use a soft bristle brush for stained or yellowed areas. If using on vinyl or leather, dilution may be needed. Always check for color fastness in an unseen area. All I can say is WOW! I used this on tires, and they are beautiful. Also used it on plastic steps and window trim. Everything looks brand new. I just hope this does better in rain than 303. I will buy this again. I have tried many tire dressings but this one seems to perform the best for my purposes. If thin coats are applied (base then final coat), I get the luster that pleases me without the sling. Instantly brings back the shine to even the dullest of tires. I have even used it on some plastic parts. I favor this version over the gel. I live in the Phoenix area, and it doesn't attract dust, gives tires a subtle luster and seems to last quite a while. A little goes a long way. I've also used it on black trim too - and it does quite well. Apply to tires using Lake Country applicator - you can't go wrong.